The 2003 Tokachi-oki earthquake (M w 8.0) in northern Japan generated large-amplitude long-period (4–8 s) ground motions in the Yufutsu sedimentary basin, causing severe damage to seven large oil storage tanks with floating roof structures because of severe sloshing of oil. The 30,000–40,000-m3 tanks having suffered the severe damage such as fires and sinking of floating roofs experienced the sloshing with large amplitudes exceeding 3 m in which the fundamental mode was predominant. The second mode of sloshing was also excited in the 110,000-m3 tanks in which their floating roofs sank into oil, indicating that the higher modes of sloshing as well as the fundamental mode should be considered in damage prediction. 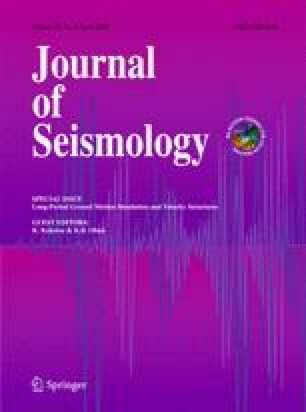 The strong ground motion recordings demonstrated the earthquake dependency of predominant periods and the substantial spatial variation of the long-period shaking observed within the Yufutsu basin, meaning the necessity of source- and site-specific prediction of long-period strong ground motions. The two-dimensional numerical modeling suggested the importance of detailed structures of soft near-surface sediments as well as deep basin structure for accurate prediction of long-period strong ground motions in deep sedimentary basins.